All is well on both sides of Everest as we enter the weekend. The China Tibet Mountaineering Association announced that 150 foreigners have been given permits on the Tibet side. This compares to 336 foreign permits issued on the Nepal side according to the Nepal Ministry of Tourism. This is slightly down from last year. Things are pretty normal at Everest but back in Kathmandu, a plane skidded off the runway at 10:30 pm on Thursday, shutting the airport down. This is the only international (and domestic) airport in Kathmandu so the early morning flights to Lhasa for teams climbing out of Tibet, and to Lukla for those climbing from Nepal were delayed. The airport reopened at 11:30 am Thursday after being closed for 12 hours. Lukla has the reputation for being the “world’s most dangerous airport” (see this excellent short video on Lukla with comments from pilots) but Kathmandu is quickly gaining a harsh reputation for crashes. This is the second incident in about five weeks. On 12 March, 49 people were killed when a privately owned Bangladeshi carrier, US-Bangla Airlines, flying from Dhaka, Bangladesh approached the runway from the wrong direction, crashed and burst into flames. While Lukla makes many “most dangerous lists, Paro Airport in Bhutan is ranked number one, only eight pilots are qualified to land there, on this list as well as LaGuardia Airport in New York City makes the top ten list. Icefall inspection and gear carry today by our guide team to Camp 1 today and it’s in the best shape I’ve ever seen in in the last 8 seasons! 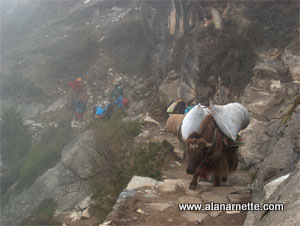 Our Sherpa team was also carrying loads to Camp 2 today as they have been for many days. Thanks to the Icefall doctors for making a great, safe route to Camp 1. I was skeptical at first with the media reports but it’s true, it is in phenomenal shape! I counted 9 ladders to camp 1 and most of them pretty easy to cross. We will be heading up on our first rotation in a couple days! Speaking of the Icefall since it gets so much attention, Canadian Mathieu Durand reached Camp 1. Very pleased for him as he got sick last year and had to abandon his expedition but he worked hard to get back. His Garmin MapShare shows his path through Icefall. It hugs more to the climber’s right as in previous years then shoots left finally arriving near the center at the top of the Icefall. I added a red line marking the rest of the approximate route to the summit. Asian Trekking, with three large teams on Everest plus other 8000ers this season, posted a few pictures of the Icefall Doctors installing ladders near the top around 19,000’/5791m. This ladder setup is pretty standard each season as the Icefall begins it 2,000’/609m drop over one mile/1.6km. 2018 Khumbu Icefall Upper Ladders. courtesy of Asian Trekking. We are now all settled into Everest Base Camp having arrived yesterday afternoon after a hearty 5 hour hike. I think everyone is happy to be settling into our home away from home. We are eagerly awaiting the arrival of our final Lhotse climber who is just a few days behind coming up the valley. We’ve made sure camp is comfortable this year, with plenty of attention to detail in our CTSS set up. We have a carpeted, heated, custom made dining tent with a separate washroom so everyone can wash their hands before coming inside, a full catering kitchen (literally we have 3 stainless steel kitchen benches, a 3gas burner stove, sinks, and a full oven! Fresh bread everyday!) The kitchen is staffed by chefs who have been trained at 5 star restaurants and who have been fuelling us with the best meals we’ve had since we’ve been in Nepal. Lunch today was burgers on freshly baked buns with potato salad and fresh steamed broccoli! The state of the art Communications Tent is set up, with a brand new radio base station to keep in touch with our teams as they move up the mountain, a carpeted Hang Out Tent with blow up couches perfect for movie nights on the projector. Each member has their own tent with a full mattress and pillow, insulation flooring and as many hot showers as they want! Not to mention a western style WC with a washroom to keep everything hygienic. So if they report home that they’re roughing it, you can give them a little grief! The reality is CTSS’s version is very similar to what long time outfits provide, including Adventure Consultants, Himex, Alpine Ascents, Jagged Globe and the rest. This has become the base level of service these days on Everest for the mid to high price teams. In 2011, I did a deep dive with Russell Brice about his then legendary base camp amenities. It was a lot of fun and informational. You see it at this link. Today, most top companies have matched many of his features. Some people are wondering if Russell Brice is on Everest this year. Yes, he is with a relatively small team running out of the Nepal side. Last year, while on K2, he stirred up speculation with a cryptic post that he would “hang up the guiding boots.” He later clarified the point that he was not leaving guiding altogether but rather planning to spend less time at base camp. Well, word has it he has a new business partner but he is certainly at EBC. Meanwhile, his website has another cryptic message with the message that “something is happening” but zero content, a bit odd to happen in the midst of an Everest season. Good morning from the Khumbu valley. We are currently 2hrs from Base Camp. I hope this post lifts your spirits. The landscape and the environment here is so uplifting. An ambition of my time here is to always smile. The world is full of too many frowns. The world is such a beautiful place and I hope that the light and happiness can leap from these posts like a dose of positivity. There will be difficult, dangerous times ahead but I am charged with positivity. I hope that my adventure will encourage you all to follow your own dreams. Turn the ‘don’t’, ‘won’t’, ‘can’t’ and ‘shouldn’t’ I to the ‘do’, ‘will’, ‘can’ and ‘should’. It’s so easy to say no. There is always an excuse to put things off for another day but my advice to you is seize the moment. Don’t procrastinate. Live for the moment because you never know when it may end. Have a beautiful day. Smile at those you pass and be kind to one another. This was a really awesome report and thanks for keeping us to date what’s happening there. Everest is on my bucket list for a while and reading your post made me realize that it’s probably time to cross it off! Excited to follow David Snow and Thomas Wilkinson for round 2 after being turned around at the South summit last year by high winds.